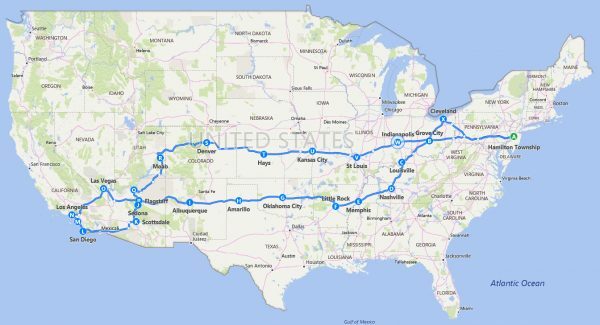 Without further ado, here is the eastbound conclusion of our epic Cross Country Bus Adventure, courtesy of Tour Director, Gene Gray! It’s time to say good by to San Francisco. The luggage was once again taken from INSIDE each room this morning. So, not wanting a repeat of last year, I was carefully checking off each piece of luggage as it was brought down while Hank counted as he loaded each on the bus. Every piece of luggage was accounted for! Nancy’s cousin in San Francisco created a welcome sign for when we first arrived and hung it on the wall behind the front desk of the Hotel Zephyr. It was a wonderful gesture and we proudly took it with us as we bid the hotel a fond farewell with Tony Bennett singing through the speakers. We crossed over the Oakland-San Francisco Bay Bridge onto I-80 East into another beautiful day with temperatures in the mid 60’s and light winds. 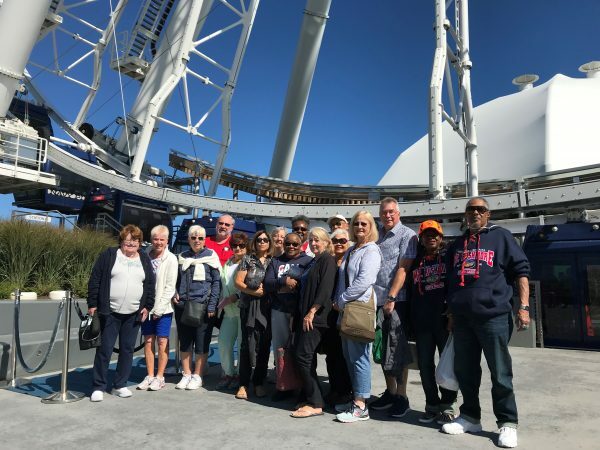 As we traveled east for the first time, our tour guests shared the great experiences they had yesterday in San Francisco. It’s so wonderful to see them breaking off into small groups and mingling among the other tour guests – almost like family. Five found their way to Chinatown and ate a magnificent meal provided by the chef himself. The restaurant was recommended by the Hotel Zephyr staff and the chef treated them like royalty. Different foods were continuously served by the restaurant staff at the suggestion of the chef. These lucky tour guests did not have to order anything – they just paid $25 each for an all you can eat feast. Another tour guest walked to Lombard Street and walked down the winding, curving hill. Another took a bus to the Golden Gate Bridge and walked across it. I am so happy for the time everyone had in this fabulous city by the bay. Later, I played the movie, “Escape From Alcatraz” starring Clint Eastwood. The movie was a great conclusion to our fabulous tour of Alcatraz from yesterday and the tour guests were all able to relate to the movie. As we entered Tahoe City, Lake Tahoe glistened in the mid-afternoon sunshine. For lunch, I provided a list of restaurants for my 32 friends to choose from. They would eat and pay on their own today. Many went to Jake’s on the Lake and enjoyed a delicious lunch with beautiful Lake Tahoe as a backdrop. Others strolled the town and found a fine cafe or restaurant. Some hiked the trails to the water’s edge. We all enjoyed our two hours in Tahoe City, California and many commented they’d love to return here one day. It didn’t take us long to cross the Nevada border and it didn’t take long for many to fall into a deep sleep. The scenery changed from majestic mountains to flat, dry land with parched yellow grasses as far as the eyes could see. For the next two hours, the passengers slept, read, played games and did puzzles. The bus was so quiet, one could hear a pin drop. Hank continued to do a great job driving through the desert. We stopped in the only piece of civilization that existed since we left Lake Tahoe. Located in the town of Lovelock, Nevada, the Conoco Truck Stop offered clean bathrooms and a Convenience Store. It felt great to stretch our legs. Once back on the road, we only had a little over an hour to reach our destination – the Winnemucca Hotel and Casino. I played “The Three Amigos” for some goofy comedy relief. The tour guests enjoyed this movie but had to wait until the following day to see the conclusion – a real cliff hanger! We pulled into the Winnemucca Hotel and the porters were waiting to deliver our luggage to our rooms. I handed out the keys to each guest and Hank agreed to do a Walmart run in 45 minutes since he also had to fuel the bus. Fourteen passengers went to Walmart. I stayed back at the hotel. After the bus left for Walmart, one of our guests, Nancy, asked me whether all the luggage was delivered because her suitcase was not yet in her room. I answered that I thought so but we went to check with the manager and he confirmed it. So Nancy, the manager, and I knocked on every one of our “Starr” rooms with the hope that the luggage was placed in the wrong room. We knew to do this because this has happened a few times on past trips. Even rooms that were vacant were opened and checked for Nancy’s luggage. All to no avail. One room had a “Do Not Disturb” sign on the door so we passed it by. The bus finally returned so we quickly double-checked to see if the luggage was still in the luggage bay of the bus – it wasn’t. Our wonderful tour guests began to offer Nancy some of their clothes. While Nancy and I continued walking around the hotel in hopes of finding it (two hours have passed since our arrival), my phone rings. Sure enough, the tour guests with the “Do Not Disturb” sign on their door returned to their room and found that Nancy’s luggage was there. The tour guest told me she always puts the “Do Not Disturb” sign up whenever she goes into her room and keeps it up. How unlucky for Nancy. But she was a great sport about it – Thank you Nancy! Here’s what happened: Nancy’s assigned room was 129 and the porter misread the number and put the bag into room 109. Simple but worrisome mistake. Who was it who said, “These are the times that try man’s soul?” Oh, right. It was Thomas Paine in 1775 and me in 2018! After enjoying a relaxing, sit-down breakfast with generous portions, we departed on time for another beautiful day with sunny skies and cool temperatures. We finished “The Three Amigos” and at its conclusion, I provided information on Winnemucca, Salt Lake City, and the history of the Mormons. 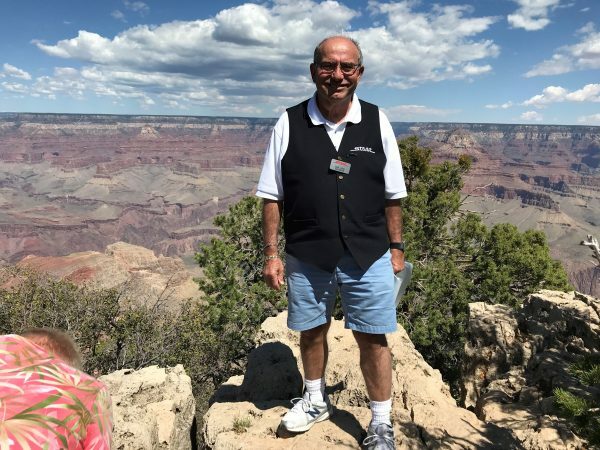 As we began our trek through the northwest section of the United States, I talked about the greatness of some of our Native American Chiefs, in particular Chief Joseph whose Nez Perce tribe once lived freely in the territory we were driving through. I played the movie “I Will Fight No More Forever” named after Chief Joseph’s famous speech “Hear me, my chiefs! I am tired. My heart is sick and sad. From where the sun now stands, I will fight no more forever.” The movie depicts the plight of the Nez Perce tribe following an edict from President Grant that removed them from their land. They fought and tried to outrun the US Cavalry, but were eventually caught. It is a very sad movie that shows the horrible treatment of brave Native Americans by our own government. Tissues were suggested. Over half of the passengers intensely watched the movie. Even though I’ve seen it at least 10 times, as always, tears were falling from my eyes by the end. We stopped for lunch in Wendover, Nevada. Hank parked in the middle of this huge parking lot between four restaurants and our one hour stop was plenty of time. Since we were directly on the border of Nevada and Utah, some clocks jumped ahead one hour into Mountain Time while others took longer to adjust as we soon continued into Utah. The western Utah countryside is a large flat desert for as far as one can see. The surface begins to appear white and becomes more consistently white as you progress further into Utah. These are the salt flats but it looks very much like snow. We passed the Bonneville Salt Flats and then the Morton Salt Manufacturing Plant as we neared Salt Lake City. Soon we came upon the Great Salt Lake on our left, bordered by majestic mountains in the distance. 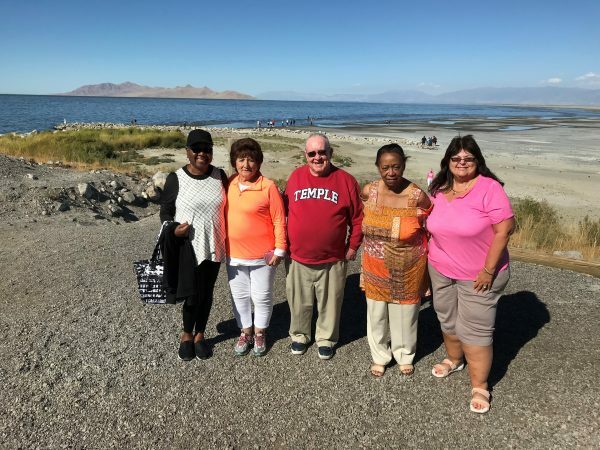 We stopped at The Great Salt Lake State Park to take pictures and give some guests the opportunity to put their feet in the lake. We stayed here for 25 minutes enjoying the magnificent views in 80° temperatures and then finished our journey into Salt Lake City. The Hampton Inn was all ready for us. I handed out the keys to the passengers and three porters quickly delivered our luggage. We had an hour to relax and refresh before Hank drove us to Christopher’s Steakhouse for dinner. We sat in the same comfortable section of the restaurant as we did last year. We were greeted warmly and the service was wonderful. Salads and hot rolls were placed on the table. The salads consisted of green leafy lettuces, tomatoes, onions, and their house vinaigrette dressing. We all relaxed, took our time eating, and had terrific conversations. After a nice delay, the main course came out. The numbers were equally split between the delicious medium rare Filet Medallions and the superb Chicken Piccata. Each dish was accompanied by zucchini and mashed potatoes. Dessert was a generous slice of New York Cheesecake, reminding us of home. Everyone complimented the excellent food and enjoyed their dinner immensely. I noticed one difference between running this trip in September vs July is the sunlight hours get shorter this time of year. By the time dinner was completed, it was already dark outside. Hank drove us around the Mormon Temple, and in contrast to last year, we did not get off the bus to explore Temple Square. We eventually drove back to the hotel and wished each other a good night closing out another wonderful day. I downloaded and played a few Donny and Marie Osmond songs as we drove away from Salt Lake City. It was another picture perfect day as we climbed over 7,000 feet in elevation and then descended down to 4,000 feet amidst the most beautiful mountainous scenery one could ever imagine. The passengers were taking in these magnificent terrains with its plethora of colors and irregular rock formations. Although we all know that each section of the United States has its own beauty and differences, it is amazing to actually see it before our very eyes. We made a fast rest stop within the mountains and continued into the scenic state of Wyoming. The mountains affect weather patterns making the western part of Wyoming extremely dry. It is also flat and desert like. Many fenced in ranches make up Wyoming and we saw people on horses riding or herding their sheep and cattle. It was a good time to play my Western Music playlist that added to the realities of this area. We were soon in the one street long western town of Alton, Wyoming where we stopped for 90 minutes for lunch. Alton has nine eating establishments for us to choose from, and each was described as very good. After lunch, we began climbing into the majestic mountains again. A small river, turquoise in color, meandered to our right as the mountains rose on all other sides. Nature is the most talented artist and this section of Wyoming certainly proves that. I played John Denver songs that enhanced our visual surroundings. By 3:00 PM, we were at the 49er Inn & Suites in Jackson, Wyoming. The manager handed me the keys and came onboard the bus to talk about Jackson Hole – its restaurants, shopping, and the Town Square. The passengers disembarked and had the remainder of the evening on their own to explore this marvelous city. Jackson Hole is a valley nestled in the magnificent Grand Teton Mountains. It is famous for its great powdery ski slopes as well as being the gateway to Yellowstone, 90 minutes to the north. The town of Jackson resembles a town in the Wild West with its buildings, wooden walkways, and overall architecture. The Town Square, a park in the center of the city, has four archway entrances, each made of elk horns. The stores feature Western art, Western apparel, and area souvenirs. I’ve been in touch with Jesse, our bus driver and guide for Yellowstone National Park tomorrow. He was really excited about doing our tour and secured a newer bus for us for tomorrow. He worked tonight to prep the bus for our tour that begins bright and early at 7:15 AM. Jesse and his Alltrans Bus arrived at exactly 7:15 AM and we departed for Yellowstone ten minutes later. We continue to be blessed with gorgeous weather. Temperatures were brisk (in the mid 40’s) and the sun was bright. The Alltrans bus was cramped with very little leg room and no bathroom. Our passengers were great sports and did their best to put up with these inconveniences. Our Starr Bus was soooo much better. Even Hank complained about the leg room. It was nice to have Hank join us again on his day off from driving since he always wanted to see Yellowstone. Jesse was passionate about Jackson Hole, the Grand Tetons, and Yellowstone National Park and knew just about everything associated with each. He told us about the wildlife that we might expect to see. As it was, we saw elk, bison, and deer throughout the day. Jesse explained in simple terms the chemical composition of the different land features in Yellowstone. I overheard some passengers reminiscing about high school chemistry class with horror. He also discussed each section of Yellowstone and the constant geological changes that continue to take place. He shared about recent fires that were actually good for the park by burning underbrush that helps the soil become more fertile in order to grow new trees. Jesse stopped every 45 minutes for a fifteen minute bathroom break at strategic spots and we arrived at Old Faithful Geyser by 10:15 AM. 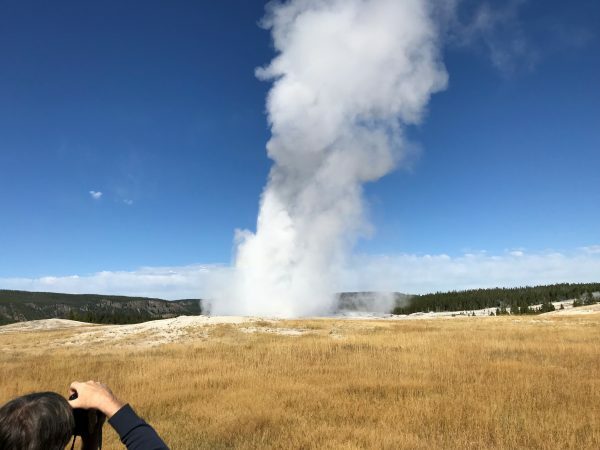 Our guests were given time to shop in the gift shop and were told to be outside to watch Old Faithful erupt at 10:40 AM. Old Faithful did erupt as scheduled but it was a wimpy eruption. I was very disappointed because I wanted our guests to have a better experience. The restaurant opened at 11:00 AM so we all bought our lunch. We were supposed to be back on the bus after lunch at 12:00 PM, but before we were about to board, I found out that Old Faithful was to erupt next between 12:06 and 12:20 PM. Jesse was amenable to us staying a bit longer to hopefully experience a better show and the old geyser didn’t disappoint this time. She erupted to over 150 feet putting on a beautiful display. Now I was satisfied and my 32 friends were elated. We drove the lower loop in Yellowstone which was 96 miles around. Yellowstone is huge with over 300 miles of paved roads. It was also our nation’s first federally protected area in 1872 and our first National Park in 1919. We noticed a field of bison near the road and pulled over to take pictures. Our next stop was the Fountain Paint Pots. Jesse lead us on the half mile circular walk on a boardwalk path to get an up close and personal look into bubbling pots of mud and sulfur, aqua colored steaming pools, and geysers. The colors and smells were striking. You were able to feel the heat coming up from the surface below. After another bathroom break, Jesse drove us to the Upper Falls, the point where water barrels down the steep slope of the gorge with all its power and fury. The angle of the sun shining on the raging waters below created a beautiful rainbow to add to the magnificence of the scene. 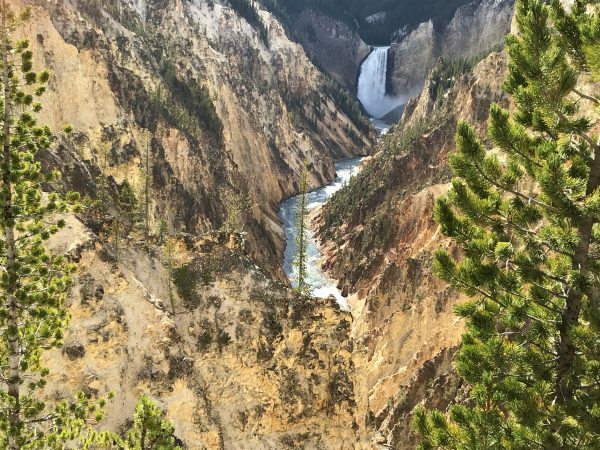 We then drove another ten minutes to the Lower Falls also known as The Grand Canyon of Yellowstone. The spectrum of colors on the walls of the gorge were vibrant. In the distance, you saw the raging waterfall that we had just departed from. The scene was real, but looked like another brilliantly painted canvas created by nature. Our guests continue to be amazed at the beauty of each of our National Parks. Each Park is totally different from one another and equally as magnificent. Choosing one’s favorite is a matter of individual experiences and personal tastes. Noticing the magnificence of each is reality. We arrived back to Jackson at 6:45 PM after an 11.5 hour day. We were all exhausted. I made the decision to postpone luggage pickup and departure 30 minutes later than planned tomorrow morning. Everyone was in agreement. The passengers disembarked the bus thinking about dinner plans and remembering an exhilarating day at Yellowstone National Park. Today’s experiences will surely last a lifetime. HAPPY BIRTHDAY HANK!! 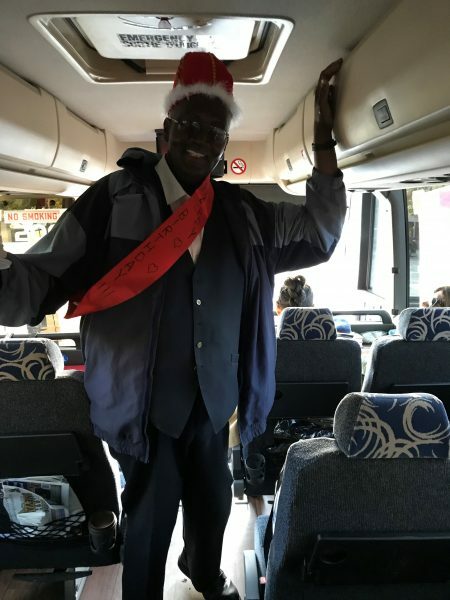 !😊❤️ Our thoughtful guest Nancy provided a king’s party hat and a sash that said “Happy Birthday” and put them on Hank. We all stood outside the bus singing “Happy Birthday” and taking group pictures. 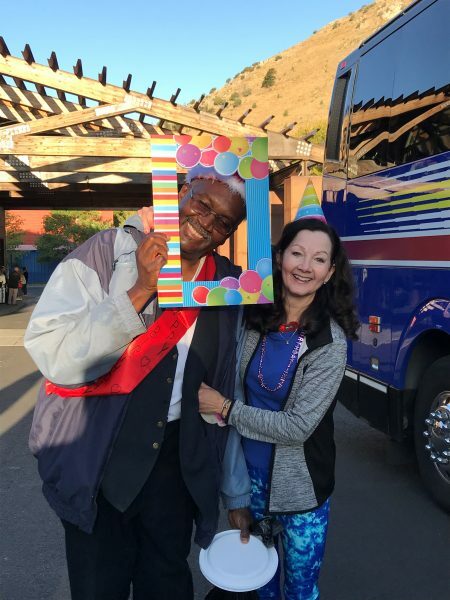 Nancy also decorated the bus with a “Happy Birthday” sign. Hank was very touched!!! I told Hank I’d be sending these birthday pictures into Starr. He said, “I’m in trouble now! !” I recommend that Starr prints out the picture of Hank and give it to Cheryl to hang up in the dispatch office. (Shhh, don’t tell him I said that!) 😊 We departed Jackson just a little later than expected. Today was the longest day of riding. I played two hours of music, mostly requests, that got us to our first rest stop. I then played “The Buddy Holly Story.” The plane carrying Buddy Holly, Ritchie Valens, The Big Bopper Richardson, and the pilot crashed in 1959 in the vicinity of where we were driving. This movie touched everyone and ended just as we pulled into Johnny J’s Diner in Casper, Wyoming, an authentic ‘50s diner, complete with a soda fountain counter and retro decor. Lunch was very good. The servers treated us like royalty. Casper is rated the 8th Friendliest City in America! If the servers at the diner were any indication of the entire town, Casper is well deserving of this honor. We were on the road again in 1.5 hours. Wyoming is a large state and it seemed endless. The passengers relaxed until our next rest stop 2.5 hours later. After the stop, I began discussing our plans for tomorrow and providing information on Mount Rushmore. I then showed the 50 minute History Channel Documentary on Mount Rushmore. 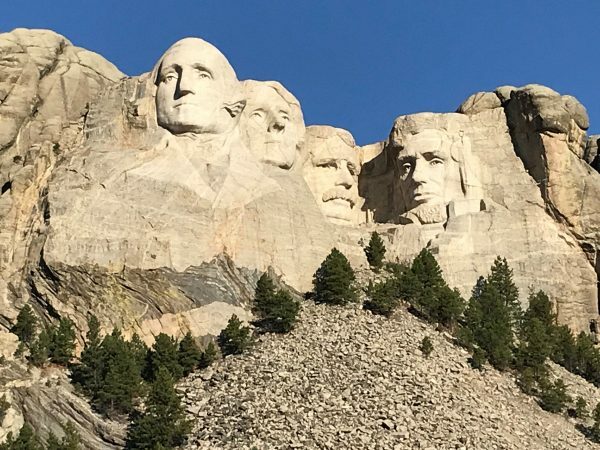 It told about Gutzon Borglum’s vision and his magnificent talents as a sculptor to create this massive sculpture that honors four presidents. The passengers enjoyed this video very much and gained insights into what we will be seeing tomorrow morning. The sun went down on the easternmost section of the Mountain Time Zone and we arrived in Deadwood after sunset. The hotel was ready with our keys and porter service. Laurie from the Mineral Palace met me at the door, handed me the keys, and stepped onto the bus to welcome our passengers to Deadwood. The hotel also provided a wine, beer, ham, and cheese reception to everyone’s delight. I suggested to my guests to explore Main Street as early as possible. There were still a few shops and restaurants open on Main Street past 7:30 PM, our arrival time, and many passengers were able to find and purchase their special souvenir for this area. They all seemed to really enjoy Deadwood and they were particularly pleased with the rubber duck the hotel placed on each bathtub for us to enjoy. We have a very early departure tomorrow. Today was another successful day. Once again, Happy Birthday to Hank!!! We ate a fast continental breakfast at the Mineral Palace and purposely left before our itinerary suggested. I wanted to get a good head start on this exciting day filled with magnificent attractions and many hours of driving. Traveling from Deadwood to Mount Rushmore took 70 minutes and we were the first bus to enter the park. We were so fortunate having crystal clear blue skies and sunny weather for optimum viewing of the monument. The passengers marveled at this masterpiece in granite, an extremely patriotic relic of our great country. Washington, Jefferson, Roosevelt, and Lincoln looked majestic and brilliant in the bright morning sunlight. We had 90 minutes to take magnificent pictures, hike to the base of the Monument, visit the Museum, and shop in the Gift Shop. To most, experiencing Mount Rushmore was the completion of a bucket list item. As with all the other sights we’ve seen on this trip, passengers commented that you could see these in books and on TV, but there’s nothing like seeing Mount Rushmore (and all the other National Parks) in person. Being there takes on a completely different meaning and is unbelievable. Everyone was ready to leave on time. It was amazing that just as we were leaving Mount Rushmore, thick clouds of fog began rolling in. Our timing was perfect! We continue to be extremely blessed with perfectly clear and sunny weather every day of our trip. Hank has been absolutely magnificent driving the bus. The passengers love his reserved and very funny personality. Hank proceeded to drive sixty miles east to the famous Wall Drug Store. It was here that we all ate a delicious lunch in the Wall Drug Store Cafe and had time to shop in over twenty different themed stores, all under one roof. The passengers had 90 minutes on their own here and everyone thoroughly enjoyed this lunch stop. Hank then drove us through Badlands National Park while I did the guiding. 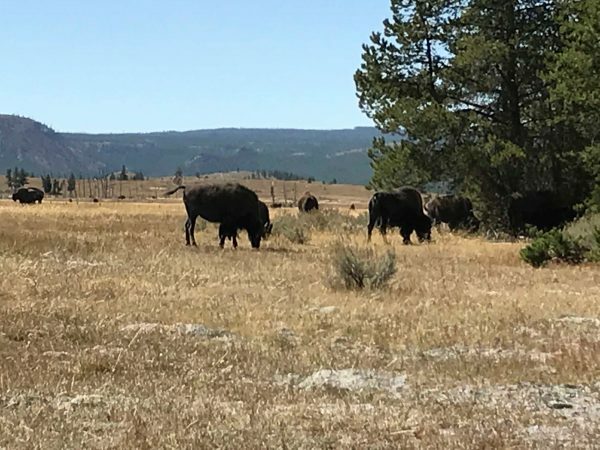 Upon entering the park, we spotted a herd of bison grazing on a grassy field on the right side of the bus. Once in the park, we stopped at three strategic viewpoints along the 24 mile Eastern Loop; Pinnacle Point, the Great Basin, and Panorama Point. 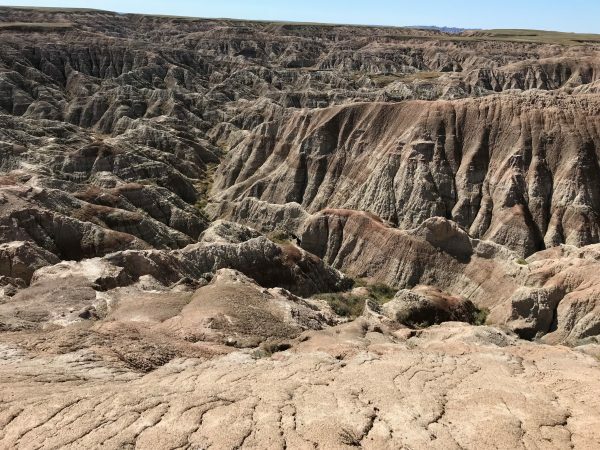 Each viewpoint was different and depicted the Badlands in its finest attire; including all the vibrant colors and brilliant natural formations. We suddenly stopped along the roadway when we spotted Prairie Dogs along with their vastly complex maze of underground tunnels in which they live. The passengers took numerous photographs. Before exiting the Park, we stopped at the Visitors Center for twenty minutes for the bathroom, shopping, and further information. The Badlands was our last look at Canyon Country and all the passengers loved its endless beauty. Hank continued to drive east on I-90 through South Dakota. At the 200 mile marker, our clocks jumped ahead one hour into Central Time. We continued to a rest stop off of Exit 260 that included an Arby’s and a grocery store. Our timing for the day was magnificent. We arrived at the Comfort Inn in Mitchell, South Dakota ahead of schedule. The hotel, nestled among many restaurants, hotels, and a mall, was ready for us. Many passengers were eager to explore the area. The Comfort Inn is an improvement over the Days Inn we stayed in last year. Today was another exhilarating day enjoyed by everyone with more amazing bucket list items checked off. The sun was shining and the temperatures were brisk as we pulled away from the Comfort Inn on this first day of fall. We stopped at the famous Corn Palace of Mitchell, South Dakota, just ten minutes away. Home to local events, performers, conventions, exhibits, stage shows, and Dakota Wesleyan University and Mitchell High School basketball games, the Corn Palace is a beautiful arena. The walls are covered with huge mosaics created solely with ears of corn depicting scenes from the history of Mitchell. Each ear of corn is cut in half and stapled to the wooden frame to create each artistic masterpiece. The colors are striking. I especially liked the mosaic of two color hands shaking as a sign of peace and the mural showing Mount Rushmore and Native Americans. After a short visit, we stopped in the Gift Shop before heading back to the bus. We had a long day of traveling. After playing a few wake up songs, I showed the DVD “La Bamba.” This movie tells about the difficult life of Richie Valens, his quick rise in the music world, and the day he stepped on that fateful plane in Iowa that took his life at only 17 years old. We stopped at the Minnesota Welcome Center rest stop as we crossed the border from South Dakota. Many of our tour guests picked up a Mall of America information brochure. We have a group that loves to shop and many commented they would love two days to truly experience that mall, located just south of Minneapolis. Guests were already brainstorming ideas for Starr to create a trip to the Mall of America along with other attractions to compliment it. We continued to our lunch stop at The Ranch Restaurant in Fairmont, Minnesota. I had made reservations with Joanne, the owner, two months ago. She called me last week to confirm, and I called today to give them our time of arrival. The restaurant was ready for us. The service was great. The food was delicious. They have a fabulous salad and soup bar that most of the passengers bought as well. Everyone enjoyed their lunch very much. We were over 30 minutes ahead of schedule all day long. After lunch, many people slept as Hank continued to do a great job getting us safely from place to place. We rode through the “Breadbasket of America.” Fields of corn and wheat could be seen for miles all around us. “Amber waves of grain” were right before our eyes. I played a few patriotic songs prior to stopping at the “Loves” Truck Stop in Floyd, Iowa. Once back on the bus, I played the DVD “The Founder,” the rags to riches story of McDonalds’ CEO Ray Croc. Ray was living just north of Chicago when he built his first franchise restaurant. The passengers enjoyed the movie as we drew nearer to our destination. As we neared Dubuque, Iowa, located where Iowa, Wisconsin, and Illinois all converge, I spoke to the passengers about the new laws in Chicago. The city enforces a fifteen minute time limit for getting off and on the bus at hotels, particularly, our Fairfield Inn tomorrow and Monday morning. I discussed our plan of action to accommodate this law. We arrived in Dubuque 35 minutes earlier than expected. The porters came out of the hotel and immediately attended to our luggage. All the keys were ready and I handed them out to the passengers. Many passengers went out for a good dinner at one of the many fine restaurants nearby. Some ate at the Red Rocks, located in the lobby of our Holiday Inn. Everyone continues to marvel over their great experiences throughout this tremendous trip. It’s hard to believe we only have four days to go. We woke to another picture perfect day with blue skies and bright sunshine. We are surely blessed with all the beautiful weather that has followed us each and every day. We had our own private breakfast buffet in a comfortable conference room within the hotel. It was a delicious spread of hot and cold breakfast foods. The porter service was very slow this morning which forced us to depart twenty minutes late. Once on the road, we immediately crossed over the Mississippi River into Illinois. We were officially back in the eastern section of the United States for the first time in twenty days. I played a few morning songs and then proceeded to provide a bit of history of Chicago, the Chicago Navy Pier, and the Sears Tower (now renamed the Willis Tower). I then showed a 50 minute movie from the History Channel, titled “Sears Tower” about the building of the skyscraper, which was completed in 1973. It also explained how the Sears & Roebuck Company got its start and grew to be the largest company in America. Most of the passengers enjoyed learning all these details even though some of the documentary was a bit difficult to comprehend. We stopped at the Belvedere Oasis Rest Stop, one hour west of Chicago. It’s a beautiful elongated building that traverses I-90 with windows on all sides including the ceiling. There are at least a dozen eating establishments, a souvenir shop, and most importantly, restrooms. We continued into Chicago. I played many songs with a Chicago theme like “Chicago (That Toddling Town),” “Bad Bad Leroy Brown,” and “My Kind of Town” (to name a few) and played my Chicago (the group) playlist which put us near the city. As the spectacular Chicago Skyline came into view, I replayed the “Chicago (That Toddling Town)” and “My Kind of Town,” both by Frank Sinatra. Many tour guests and I agreed to go on the new Centennial Ferris Wheel at Navy Pier. Completed in 2016, this 200 foot Ferris Wheel rises 50 feet taller than the previous one. We are all excited to try this new experience. The kid in all of us continues to come out!!! Hank dropped us at Navy Pier and drove to our hotel, The Fairfield Inn, to deliver our luggage. It was too early to pick up our keys so all luggage was stored in a locked room on the second floor. There’s that new fifteen minute time limit that a bus can stand at a hotel, so Hank had to go quickly. Upon arrival at Navy Pier, twenty of us walked to the Centennial Wheel composed of 42 enclosed gondolas. After a short wait, we went on in groups of four or five. The 360 degree view from the top was magnificent on this clear day. Lake Michigan glistened as far as the eye could see. The Chicago skyline, made up of buildings of all shapes and sizes, created a beautiful and unique sculpture from high above. The ride was a wonderful experience. I took a group photo of our newly named “Ferris Wheel Club.” Afterwards, we all split up and went our separate ways. Some walked the length of the pier enjoying the many views of Lake Michigan, some shopped in the large mall, while most found a fine restaurant and relaxed over lunch. 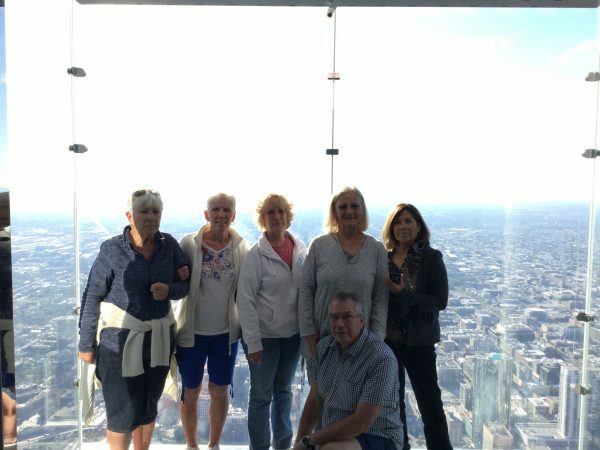 Hank met us at the bus drop off at 3:00 PM and drove us to the Willis Tower for our trip to the Skydeck on the 103rd floor. Major ground level construction circled the entire Willis Tower. Painted arrows on the the draping led us to the temporary entrance. We took an escalator down two levels to the ticket window and elevators. There were enormous lines of people waiting to buy tickets, but I walked up to the Will Call/Group Sales Window and received our tickets immediately. I then led our tour guests around a maze of switchbacks until we reached the beginning of the line waiting for the two elevators to take us to the top. 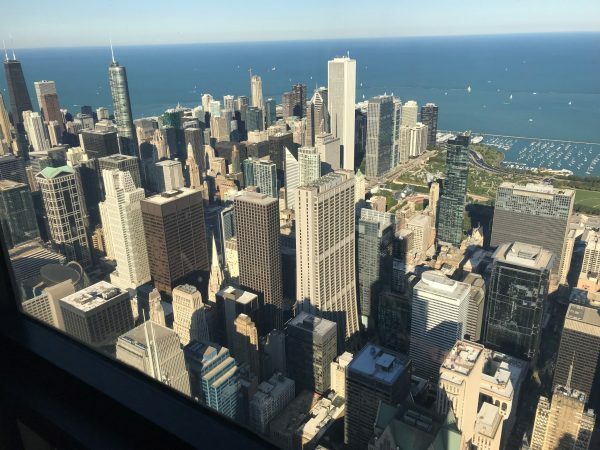 Each elevator held 25 people and took 60 seconds to reach the Skydeck. We waited 35 minutes to get into the elevator so I texted Hank to adjust our pickup time to 5:45 PM to maximize our experience. The views from the Skydeck were phenomenal. You could see for 50 miles in all directions. Many of our passengers waited on a small line to get their pictures taken on The Ledge. They stepped out on a clear ledge offering the illusion you were suspended 103 stories above the ground. Pictures were taken. Everyone enjoyed this experience. Once back on the ground, many walked across the street and took a picture of themselves with the “Historic Route 66” sign. We then relaxed at a small park and waited for Hank, who arrived exactly at 5:45 PM to pick us up and drive us to the Fairfield Inn. 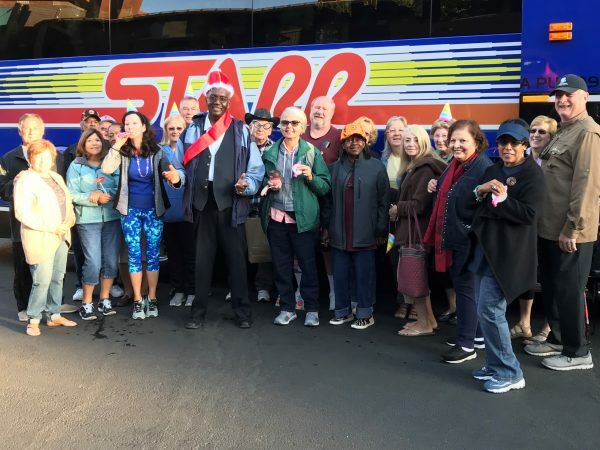 Due to the fifteen minute law, all passengers got off the bus with all their needed belongings and walked into the Fairfield Inn lobby where I handed each their room keys. Hank left the area with time to spare and had to drive miles away to park the bus and then take a cab back to the hotel. Oh, the things Hank does for us! As I went up to my room, passengers approached me with news that their luggage wasn’t delivered. I immediately went back down to the lobby. They had forgotten to deliver the luggage once the rooms were ready. They apologized many times. One person with a cart delivered all the luggage which took about 45 minutes. Many passengers actually took their own luggage to their room. Many of us ventured out onto the streets of Chicago to do some shopping or go to a fine restaurant. Some went across the street to have pizza or subs for dinner. Today was another beautiful day with many wonderful experiences. The plan to leave Chicago with the bus stopped for only fifteen minutes worked perfectly. The luggage was brought down and kept in the Fairfield Inn lobby while I watched over it. We had all 32 pieces of luggage. The passengers all finished breakfast and were waiting to board the bus with their belongings. Hank got caught in traffic and was a little late. Plus, he accidentally sliced his thumb on the bus luggage door and needed to stop the bleeding and bandage it up. Thankfully one of our tour guests is a nurse and did eventually bandage his thumb properly. As soon as the bus arrived, the luggage was loaded, the passengers got on, and we drove out. Today is another long day of driving. We turned our watches forward one hour 70 miles into Indiana and stopped at a truck stop and convenience store to take a short bathroom break. For the first time on our trip, the skies were cloudy and rain began to fall. I showed the DVD “Rookie of the Year,” a feel good movie about a 12 year old Chicago Cubs fan who winds up pitching for his home town heroes and winning a World Championship. The passengers enjoyed this cute movie and all applauded at its conclusion. We arrived at the Wyandot Service Plaza for a fast lunch and although this wasn’t one of our nicer stops, the passengers were able to satisfy their needs. We were now just two hours from Canton, Ohio, and our Comfort Inn. The skies opened up and it began pouring. Most of the passengers fell into a relaxing sleep with help from the rhythm of the falling rain. Dinner tonight will be in the Belden Village Mall where we’ll be able to choose between a sit down dinner or the food court. We were driving through Akron about 4:30 PM (18 miles from Canton and our Comfort Inn) when we ran into rush hour traffic. We were bumper to bumper for the next thirteen miles and got delayed over 30 minutes. When we reached the Comfort Inn, our keys were ready and the porters began taking our luggage up to the rooms. We arranged to be back on the bus at 6:15 PM to go to the Belden Village Mall. 29 of our 32 passengers boarded the bus. We voted on leaving the mall at 8:00 PM. Everyone enjoyed their time in the mall shopping and eating. We’re now beginning to ready ourselves for home; however, we continue to delight in the success of this trip and the wonders of this beautiful country. Knowing that tonight will be our Farewell Dinner, most of the passengers decided to eat a lighter than usual breakfast. We had three stops in Canton this morning prior to driving to Pittsburgh this afternoon. Our first stop was a two hour guided tour of the amazing MAPS (Military Aviation Preservation Society) Air Museum. Four volunteer guides divided us into groups of eight. They taught us about the airplanes inside the hangar such as the Sopwith Triplane with three wings from 1916 and the Blue Angels aircraft in which Navy airmen would fly in procession just 8 inches from each other. We then went outside to the newly erected Portable Hospital, similar to the Mash Unit. 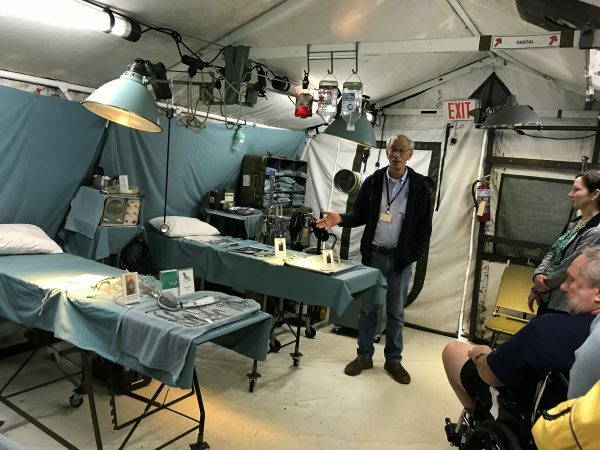 A former military physician who served in Vietnam in 1969 walked us through each section of the Hospital. There was an area serving as an operating room, another for a recovery room, a separate area for x-rays and blood tests, and another area with beds used as a sick bay. He emphasized that if a soldier or any person was brought to the Hospital, they were able to save their life 97% of the time no matter what it took. However, they were always concerned about the person’s mental status having to live with all their horrific memories or without a limb. The saddest and most humbling part of our tour was when we all actually got to sit in an airplane that was used to parachute jumpers onto Normandy Beach during WWII. Thirty soldiers would sit in the plane in complete silence to their destination. They each carried two parachutes, one weighing 40 pounds and the larger weighing 90 pounds. They carried a total of 200 pounds of gear on them. They also carried a cricket, a hand held device that you would click to let someone know you were an American troop, since speaking was not an option. When signaled by your superior, you would jump out of the aircraft in the blackness of night, possibly amidst enemy fire. In most cases, the soldiers would land totally alone. If they noticed a figure moving, they would click their cricket once. If the person was American, they would click back twice. If no clicker was heard, they would shoot to kill immediately. If the American was not in position to click back after hearing one click, he would be shot as well. Many Americans unfortunately killed other Americans this way. We learned that of the original 30 jumpers in each airplane, ONLY 2 MADE IT HOME SAFELY!!! Very sobering facts. 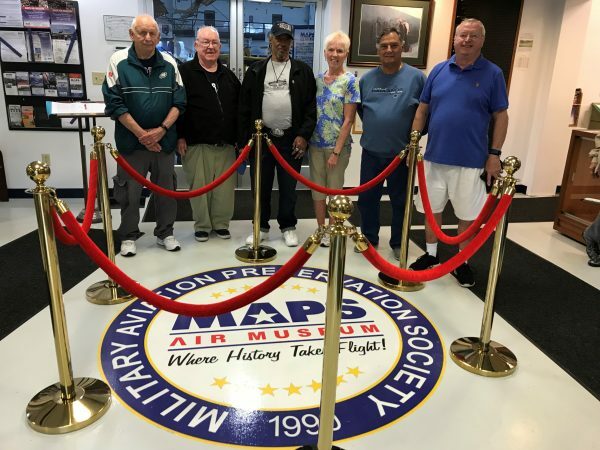 In conclusion of our visit to the MAPS Museum, I took a very special photo of our 6 Veterans in front of the MAPS logo. Upon entering the bus, our remaining passengers gave them a big round of applause. A very touching moment!!! The MAPS Air Museum was enjoyed by every passenger. Our second stop in Canton was to the Harry London/Fannie May Chocolate Factory. We shopped in the store for the first half hour and then began our 40 minute guided tour. It started with a ten minute film depicting the history of each company and how they were merged in the early 2000’s. After the video, our guide led us down a hallway and explained the numerous historical pictures on their Wall of Fame. He then showed us a vat used to heat and blend the chocolate. We were led upstairs to a closed-in walkway where we were able to look down into the factory below with all the workers creating chocolate from beginning to finished product. Our guide then gave us each a piece of chocolate to eat, guided us back downstairs, and treated us to a taste of freshly made gelato. After another brief stop at the Belden Village Mall Food Court for lunch we were back on the bus and I made THE call to our hotel for tonight, the Doubletree Hilton in Pittsburgh. Although I had called each and every hotel each day confirming our arrival and passengers’ requests, this was the call that was most critical. Last year, in 2017, the Doubletree was undergoing major renovations and failed to deliver our luggage in time for our passengers to change for the Farewell Dinner. Our guests, last year, were really upset, having brought clothes specifically for this occasion. So, when I finally did get a representative from the Doubletree on the phone, my strong remarks were, “Our time of arrival is 4:15 PM and we must have at least 2 porters to immediately deliver the luggage to all the passengers. We have an important event to attend tonight and they need to change clothes!” I was assured that the luggage would be delivered and that all their renovations were complete. Our ride into Pittsburgh was smooth. I played my Patriotic playlist in honor of both our beautiful country and our visit to the MAPS Air Museum. When we arrived at the DoubleTree Hilton I walked into the lobby and was handed our keys and two sets of rooming lists for the group. Three porters, two with carts, headed for the bus. By the time I had given out all keys to the passengers on the bus and the passengers all disembarked, 12 pieces of luggage were already on their way to be delivered. The hotel was beautifully renovated. All three high speed elevators to our 14th floor worked beautifully (compared to only 1 last year). The management staff was extremely efficient and hard working. AND ALL PASSENGERS RECEIVED THEIR LUGGAGE in plenty of time to change for our Farewell Dinner. Later on, I made it a point to compliment the night manager, who actually remembered our incidents from last year, and his staff for doing a great job for us. 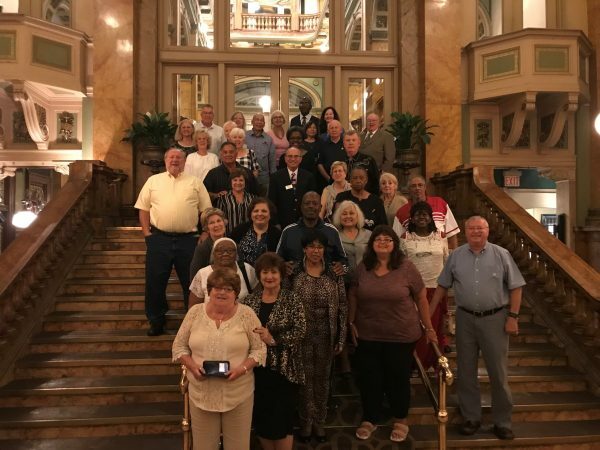 The Farewell Dinner at Grand Concourse was nothing short of magnificent. It was a marvelous celebration of a beautiful 26 day journey that has provided passengers with great memories and many new friendships. I began the festivities with a short and sentimental speech. I then acknowledged each person with their individual “Cross Country Award,” which they all enjoyed receiving. Finally, I gave out my “2018 Cross Country Statistics At A Glance” handout, three pages of details and memories from our trip. I believe the passengers were most appreciative of this. Dinner was done to perfection. Hot rolls were delivered to each table followed by a delicious salad. Our hot entree followed. The servers were friendly and efficient. The food was delicious. Everyone had a terrific time. Dessert was a tasty apple turnover. Breakfast was delicious and even included a chef making fresh omelets. Everyone loved the Doubletree Hilton. Our luggage was brought down to the bus and Hank and I sorted it according to everyone’s drop off point. After a brief delay we were ready to depart. On the drive to our first rest stop, I reviewed the entire trip through music. The songs brought back some of our fondest memories. I sent a voluntary email sign up sheet around and most of the passengers provided me with their email address. I plan to keep in touch with everyone by sending updates and pictures. In turn, they have the opportunity to do the same. Before departing from our first stop, the South Somerset Rest Area off of the Pennsylvania Turnpike, I handed out the Starr Confidential Surveys for all to fill out. The weather was intermittent showers and sunshine. The high humidity was back. We all felt the change immediately when we stepped off the bus. Back to reality. We stopped for lunch at the High Spire Rest Area on the Pennsylvania Turnpike at the 250 mile marker. We were now on our final leg of this marvelous journey. The passengers were all eager to arrive home. Most are contemplating their next Starr adventures. I compared the Starr Catalog and its luscious trip descriptions to a “candy store for adults.” My new friends agreed. I handed out the latest Starr catalogs from August and almost every person was eager to read one. I continued playing songs related to our Cross Country trip until we reached Bensalem. Pete Borowsky, Starr’s Vice President of Operations, was there with a big “Welcome Home” sign to greet us. He also welcomed us home by handing out Philly Pretzels, a really clever gesture signifying home foods. Everyone appreciated his thoughtfulness. Pete is the husband of Sandy who saw us off 26 days ago! It took some time to move luggage to the respective shuttle buses and for the people to disembark with all their other carry on items. We all said our goodbyes and and gave each other hugs. Parting is such sweet sorrow! The people on this trip are all fun-loving people seeking a good time. We may all be senior citizens or very close to it, but we laugh and have fun with more enthusiasm than most people in their twenties and thirties. Age is only a number. It’s your inner motivation, your desire to accomplish your goals and your dreams that really matters. Complete that bucket list and then create another. The more you do, the more you laugh, the younger you feel. Click here to join us next year for a BRAND NEW Cross Country trip. The Starr team has been working hard for months planning this new tour with stops and attractions not on our previous Cross Country itinerary. I look forward to welcoming you on board and I’ll be there to experience it with you! 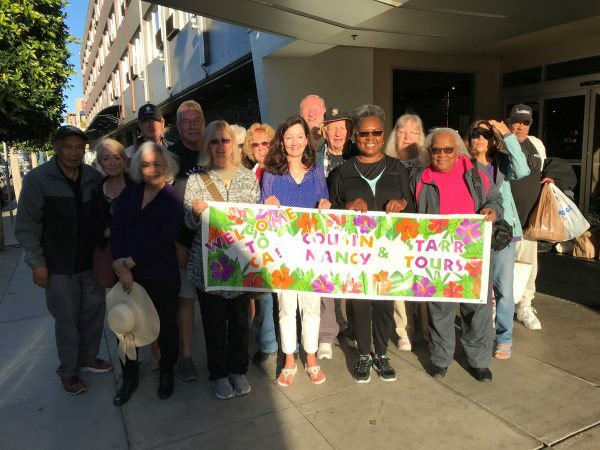 If you’re a past Cross Country traveler, if you’re booked for 2019, or still considering this trip of a lifetime, you are invited to join our private Cross Country Travelers Facebook Group by clicking here! Meet others on your trip, share memories from past trips, and get advice from those that have “been there.” We can’t wait to see you there! Happy connecting!